Director Rawson Marshall Thurber (We’re The Millers, Dodgeball: A True Underdog Story), whose style seems to consist of saying “more” and “cut,” makes the least of a decent premise and appealing cast in Central Intelligence, a shambolic high-concept farce that doubles as a cautionary tale of where studio comedies go wrong. In spots as indifferent and self-indulgent as any latter-day Adam Sandler production (complete with Sandler-esque marriage counseling subplot and teenage humiliation backstory), it switches back and forth from snail-paced to incoherently over-stuffed on a moment’s notice, with no in-between mode. 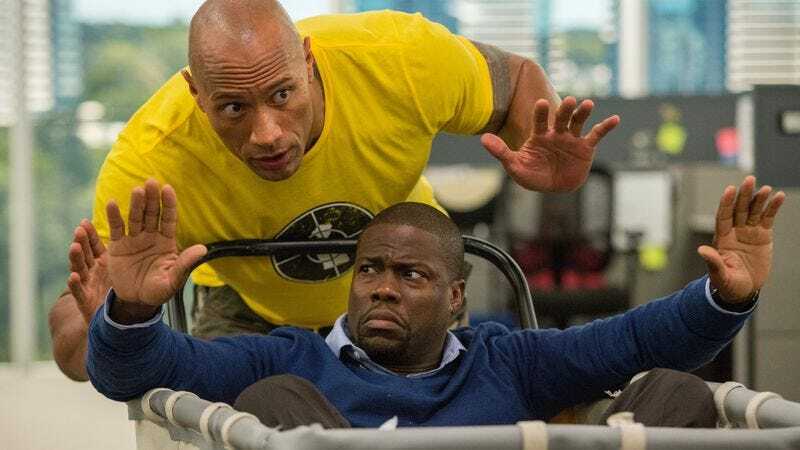 That it manages to score a good laugh every couple of minutes is mostly a credit to stars Dwayne Johnson and Kevin Hart, who make for a better mismatched-buddy comic duo than the movie probably deserves. Toning down his motormouthed shtick for the first act, Hart stars as Calvin Joyner, a meek accountant who used to be the coolest and most popular kid at Central High. Anxious about his upcoming high-school reunion, Calvin gets an out-of-the-blue Facebook message from Robbie Weirdicht, the overweight class laughing stock he hasn’t seen in 20 years. Weirdicht (Johnson), now known as “Bob Stone,” has grown up to be a rogue CIA super-agent, though he still idolizes Calvin for being the only kid at school who was ever kind to him. Through a series of a head-scratching plot holes, he ropes Calvin into a plan to evade his former boss (Amy Ryan, looking lost), clear his name, and discover the identity of an arms trafficker named The Black Badger—all in time for the aforementioned reunion, of course. As in Thurber’s last movie, We’re The Millers, there are hints of a much darker (and better) comedy buried throughout; a throwaway moment even suggests that Bob—who rides around on the same motorcycle Calvin had in school—might be manipulating the former prom king’s over-inflated sense of his teenage glory days for his own gain. 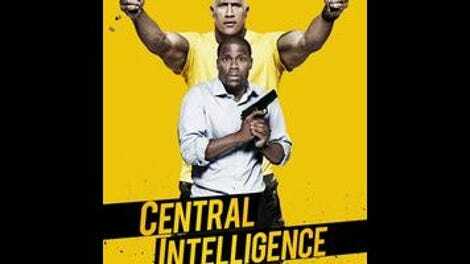 But instead of pursuing that angle, Central Intelligence opts for everybody-learns-a-life-lesson schmaltz and the kind of listless, feature-length-gag-reel vamping that’s become a common viewer hazard ever since Hollywood convinced itself that anyone can direct improv. The cast’s energy level jumps from shot to shot, and once the chases and stunts (both pretty bad) start, Hart starts veering randomly from fidgety, button-down everyman to a heartbeat away from shouting “Laaady!” in his shrillest Jerry Lewis voice. Aside from an uncredited Jason Bateman, who gets a smarmy bit role as Bob’s childhood bully, nobody seems to be playing a consistent character. Given that the movie’s bungled, sporadic plotting ends up making less sense than a Now You See Me movie, that’s a minor problem. (Plus, Johnson’s beaming confidence works whether he’s playing Bob as a globetrotting badass in awe of his own cool or a muscled superman with the mind and fashion sense of a painfully awkward teen.) But even when the actors manage to get on the same page, they still risk being disrupted by Thurber’s careless and occasionally perplexing direction and pacing. He even manages to mess up a surefire “20 years later” gag by inserting an inexplicably long opening title card sequence that looks like it was made for a community-college motion graphics class.